Easy insights: Skin cells called fibroblasts can stand in for neurons in studies of fragile X syndrome. A new finding challenges the long-held assumption that fragile X syndrome, a condition related to autism, stems from an overproduction of proteins in neurons. Many people with fragile X syndrome have average rates of protein production, the study suggests1. Fragile X syndrome is characterized by intellectual disability, unusual physical features and hyperactivity. It stems from mutations in the gene FMR1, which encodes a protein called FMRP. The mutations prevent the production of FMRP. FMRP acts as a brake on protein production in cells, so its absence has long been assumed to lead to a surfeit of proteins. The new finding suggests that this is true in only a subset of individuals with the syndrome. “It was surprising to see individual variability in what is considered a hallmark of fragile X,” says lead researcher Claudia Bagni, professor in the fundamental neurosciences department at Université de Lausanne in Switzerland. This variability means that decreasing overall protein production, which has been the focus of drug development efforts so far, would not help some individuals, she says. “A picture is starting to emerge that I think is surprising — that this measure, bulk protein synthesis, is only indirectly related to the core pathophysiology of fragile X,” says Mark Bear, professor of neuroscience at the Massachusetts Institute of Technology, who was not involved in the study. A similar picture emerged earlier this year from a study in mouse models of tuberous sclerosis, another autism-related condition. Mutations in tuberous sclerosis genes are thought to boost activity in a signaling pathway that promotes protein synthesis. But in the study, researchers found that the mutant mice make too little protein overall rather than too much. In both cases, the findings leave open the possibility that changes in the levels of individual proteins matter. “Total [protein] could be same, but maybe certain [proteins] are up while others are down,” says Peter Tsai, assistant professor of neurology and neurotherapeutics at the University of Texas Southwestern Medical Center in Dallas, who was not involved in the study. FMRP slows protein synthesis by repressing proteins that help translate messenger RNAs into proteins. In 2002, researchers reported that mice missing both copies of FMR1 make too many proteins at the junctions between neurons, called synapses3. The mice show a range of fragile X-like features, such as hyperactivity and learning problems. FMRP represses the function of mGluR5, a receptor for the neurotransmitter glutamate. In 2007, researchers showed that deleting a copy of the mGLuR5 gene in fragile X mice normalizes protein production and improves memory in the mice4. Based on these results, researchers developed drugs that block mGLuR5. But none of these drugs seem to alleviate the syndrome’s features. “We did this study out of frustration,” says study investigator Sébastien Jacquemont, associate professor of pediatrics at the University of Montreal. “There’s no question that FMRP alters protein synthesis,” Jacquemont says, but whether that leads to fragile X syndrome is uncertain. The researchers took fibroblasts, a type of skin cell, from 32 people with fragile X and 17 controls. Fibroblasts are easier than neurons to obtain and study, and mouse fibroblasts make protein at rates similar to mouse neurons, the researchers found. “The fact that you can get fibroblasts from mice and then neurons from mice and see the same results is really great,” Bear says. The overall rate of protein production in the human fibroblasts is 34 percent higher in the fragile X cells than in the controls, the researchers found. But the rate varies significantly: Some people’s cells show twice the average rate, but one-third show rates within the typical range. Mice lacking FMRP show similar variability. Different mutations in FMR1 can have variable effects on FMRP levels. But these levels do not track with rates of protein production, the study found. The study appeared 28 March in Human Molecular Genetics. The next step is to assess the production of specific proteins in cells — a tall order given that FMRP has hundreds of targets. 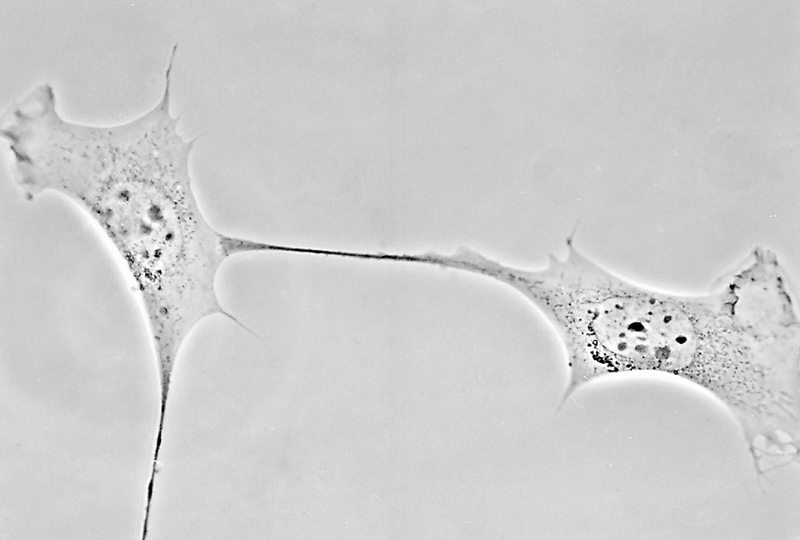 Using fibroblasts instead of neurons may make the feat manageable, Bagni says.